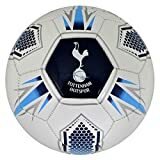 Size 5 football with Tottenham Hotspur FC branding. Great for improving your skills. This ball is not inflated for ease of posting. This is an official Tottenham Hotspur Football Club product. 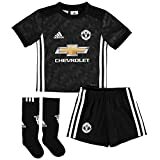 If your young child is a Red Devil supporter, then make sure to treat them to this adidas Manchester United 17/18 Away Mini Kids Replica Football Kit in Black, White and Granite.This officially licensed children’s football kit of Premier Legaue side, Manchester United made for the 2017/18 season, features a full Manchester United replica kit with a shirt, shorts and pair of socks included. Features of the 17/18 United kit includes adidas Climalite technology which wicks sweat away from the body during the heat of the action, leaving the wearer feeling cooler and drier. In the shorts, an elasticated waist with interior drawstring on the shorts keeps them in place. Designed for both boys and girls to wear on the pitch or screaming in support at Old Trafford, give the next generation of football fans a headstart by treating them to this adidas Manchester United 17/18 Away Mini Kids Replica Football Kit.